Former Labour MP Lord Mason of Barnsley has died at the age of 91, it has been announced. Roy Mason was Secretary of State for Northern Ireland and Secretary of State for Defence in the 1970s and held other government posts during his career. The ex-miner was also MP in Barnsley, South Yorkshire between 1953 and 1987. Lord Mason is understood to have died on Sunday after a long period of ill-health, having suffered a stroke about eight years ago. Dan Jarvis, Labour's candidate for Barnsley Central, tweeted he was a "great servant to Barnsley and the country". Lord Mason joined the House of Lords in 1987 having represented Barnsley Central between 1983 and 1987. He was previously the MP for Barnsley for 30 years from 1953. Roy Mason was an old-style Labour politician who rose to become a cabinet minister, serving as Secretary of State for Northern Ireland from 1976 to until 1979. He told the Labour Party conference that Northern Ireland had had enough of initiatives, white papers and legislation for the time being, what it needed was to be governed firmly and fairly. It was an approach that helped alienate nationalists. The former SDLP leader Gerry Fitt accused Roy Mason of "going native" as far as unionists were concerned. 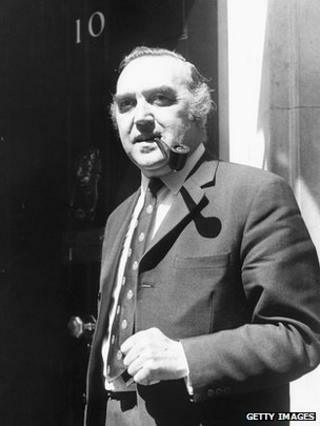 As a result Lord Fitt said he could not back Labour in the no-confidence vote in March 1979, which saw them lose power by one vote, saying his conscience could not allow him to vote for a government that retained Roy Mason as secretary of state. Mr Jarvis said: "Roy was a formidable man, a pillar of our community and a giant of the Labour movement. "He began his working life going down a mine at the age of just 14. "His incredible journey and the courage and conviction with which he served the public are testament to the values that Roy fought for all his life." He also praised Lord Mason's work in Northern Ireland at "the height of the Troubles". Len Tingle, BBC Yorkshire's political editor, said as defence secretary under Harold Wilson Roy Mason oversaw one of the most comprehensive reviews of the strength of the armed services since World War Two. "His review provoked outrage from the military but was seen by many commentators as part of a long-overdue modernisation process", he added. Lord Mason is survived by his wife Marjorie and two daughters.